Xbox One version reviewed. 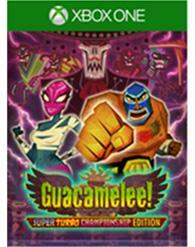 'Guacamelee! Super Turbo Championshiop Edition' is an expanded version of 'Guacamelee!,' but the review is from a first-time player. Specific additional content is addressed in the Bonus content section of the review. For the past year or so 'Guacamelee!' has passed over my attention like a cardinal shrouded under the brush of a tree. Its vibrancy would often show itself as I browsed the internet, but I never took to the time for a full look, to really even figure out if the indie title might be worth a buy. Thankfully, it's come the Xbox One with all the flourish of the first debut Games with Gold Xbox One title. I both regret never giving it my full attention before and, of course, am completely glad I waited long enough to see this complete version. No matter the emotion driving me into the luchador-infested underworld of 'Guacamelee!,' I know I'll never forget the experience. It rattles in the brain. You're Juan, a luchador wannabe imposed with true luchador abilities after he's revived from death, catapulted into a metroidvania-style adventure to save the girl. Simply put, you're travelling around a large, two-dimensional world, beating the crap out of skeletons and other underworldy foes, traversing platforming challenges and generally widening the possibilities as you unlock new abilities. That should sound familiar enough, and it feels pretty familiar in the opening hour or so. 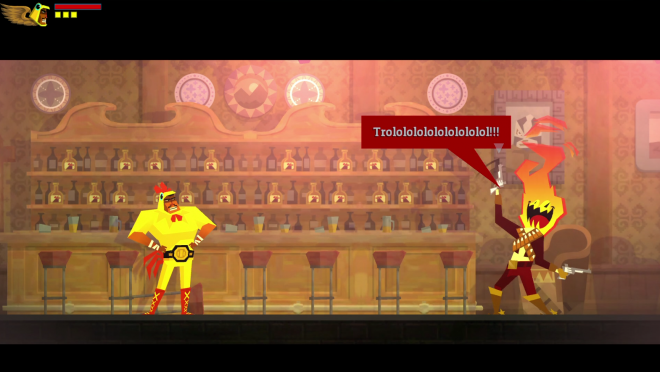 DrinkBox doesn't stray from the formula, but what they do to make 'Guacamelee!' stand out is overload that formula with extreme charm and impeccable execution. There's a tangible, immediate, and immediately satisfying correlated effort to make each and every ability you earn essential to both exploration and the immensely fluid combat system. Juan isn't just a luchador at heart now, he's a luchador of body as well, his mask and muscles divine in their ability to body slam flying dragons into pieces. Most enemies, after a number of basic hits, can be grappled with a press of the Y button and then thrown in any direction. It's this ability that drives your combos, dodging and jumping around like a Mexican bean, pummeling enemies as fast as they can spawn. Then, as you unlock abilities, which invariably open up the landscape – higher jumps, explosive headbutts, running up walls, etc. – Juan's arsenal of wrestling maneuvers ratchets up more and more until, eventually, you're stringing combos without blinking an eye. Shielded enemies, which must first be cracked with a specific, color-coded move, show up to properly counter Juan's improvements, keeping the combat fresh, requiring invention and nuance on the part of the player all the way through the campaign. That's just the punching and kicking of things though. The campaign, which takes you on a literal crash course of Mexican spirituality and culture, is riddled with self-aware humor and references to a veritable conjunction of stand-out indie titles. DrinkBox approaches the writing and storytelling with an almost obsessive desire to admit the heavy influence past games have on 'Guacamelee!,' which only goes further to highlight they ways in which the team improves on those influences. A sage-like goat commonly bemoans your destruction of his favorite statues, those wonderful things that power Juan up, begrudgingly teaching you how to use your next ability. He just can't get his head around why Juan might want to destroy everything in sight. Importantly, the platforming is creative and tight. Not only is every earned power-up efficiently countered in the following arenas, DrinkBox makes a point not to forget those power ups as the game goes on. The result is a game cranked up in complexity but with a perfectly toned learning curve. 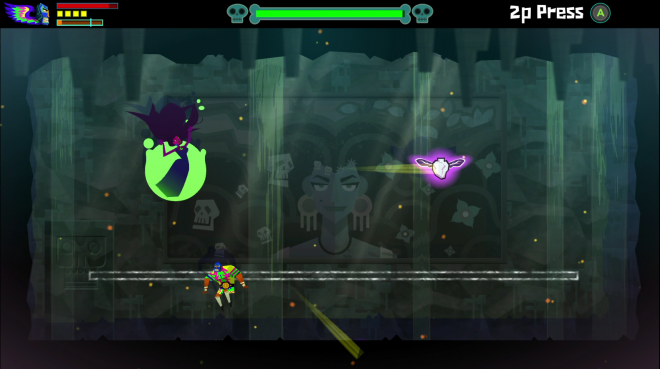 Eventually Juan can freely swap between the Land of the Dead and the Land of the Living, which in video game terms means certain platforms and enemies can be interacted with on one side but not the other, asking that you diligently swap with whatever curveball the game throws at you. The world design, ripe with side-quests and ridiculous characters to give them, comes together in a wonderful burrito-style mishmash. Hub areas of NPC characters also swap between worlds. For example sorrowful skeleton girl might ask that you recover her doll from the living world, which for a side quest, really pops with the game's Dia De Meurtos style. Just as in the platforming, everything you've earned up to any point in the game is commonly called upon and intermixed with your every punch, kick and double jump, and there's something truly engaging about that. Of course, it helps that the whole thing pops with the extravagance, violence and excitement of a piñata. 'Guacamelee!' has a lot of strong suits. None of them compare to the wholly unique motif. Much like Link would wake up to a normal day, Juan the hopeful luchador awakens to a joyous ceremony. Much like many a video game character might be thrust into an adventure after some catastrophe interrupts everyday life, so must Juan battle the lord of the Undead. For every similarity, though, there is the twist of Juan's circumstances, culture and his surrounding environments, all rendered in a sort of wild papercraft look that's both uniform and consistently surprising. Rather than visiting Hell, you visit El Infierno, El Diablo's humble undead headquarters. Instead of morphing into a ball as Samus might, Juan valiantly transforms into a chicken that pops out explosive eggs. Only on the off occasion do environments appear a little vacant, but mostly you're too wrapped up in the current challenge to notice. The result is a pragmatic, but undeniably creative take in just two dimensions. The mechanics at play benefit largely from the game's quick pacing. Once you're in the groove of things, you're zipping along and cracking skulls about as fast as you can muster, and it's those grooves in the background that encourage this the most. Zippy, athletic tunes fill this role very well, and like the visuals it's the somewhat exotic cultural roots that make the music more interesting than it usually is in a game of this nature. That said, the music remains more exotic than extravagant throughout the experience. 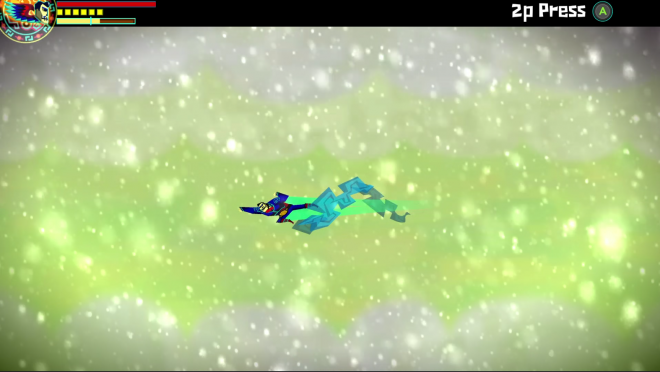 Aside from the story, 'Guacamelee!' is a complete collectathon in your hunt to power Juan up as much as humanly possible. That means finding pieces of heart to fill your health bar, segments of your stamina bar (which power certain moves) and your Intenso bar, all of which are hidden in satisfyingly hard-to-reach places. 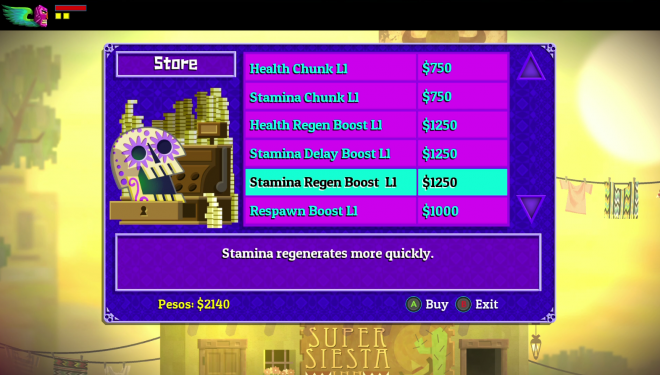 You're also powering Juan up using collected money at the store. While most of these upgrades play directly into combat, you can also purchase some pretty sweet costumes that not give Juan a new look, but tradeoff a positive trait with a negative one. I found myself attached to skeleton Juan, who never ran out of stamina but also couldn't gain health in the traditional manner. They change the game up enough to make finding the silver coins, which separately buy the costumes, a happy moment. Post-game, you're on the hunt for special orbs, requiring you complete the game's most out-of-the-way, difficult platforming and melee challenges. All-in-all, for a game that could've rested just fine on the charm and refinement of its campaign, there's a ludicrous amount of stuff to do once the final boss is felled, especially for the completionist, obsessive type. The 'Super Turbo Championship Edition,' as mentioned, comes with all of the game's DLC and two new lengthy areas, one of which features its own boss. They fit in well enough that I had to look them up once I completed the campaign to know what I was looking for. Even the boss was basically photoshopped into certain cutscenes, albeit flawlessly. Instead of just getting the game on more consoles, DrinkBox guaranteed the rerelease of 'Guacamelee!' was worth a damn. Two player co-op is also available, but it's the kind that seems thrown in at the last minute. Nothing about the game begs for a second player, and I'm sure that's the way DrinkBox designed it, shrugging with an "oh, what the hell" as the tail end of development and giving Juan an extraneous partner.